Join us for a three-day retreat right here at All in Stitches. Gather those projects you would like to work on. We’ll provide snacks, supper on Friday and Saturday night, and lunch on Sunday. Plan to eat out at noon on Friday and Saturday. Cost is $85. Hours are 9-9 on Friday and Saturday, Sunday from 9-3. And yes, you sleep at home! There are rooms to rent above our shop that will hold 2-4 people if you would like to stay over. But sign up soon as these rooms go quickly. 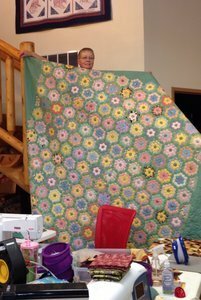 Retreats are a great way to spend some time with your quilting buddies or make some new friends. 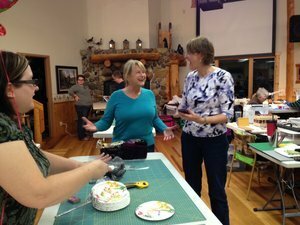 Remember … what happens at Quilt Retreat stays at Quilt Retreat! Please join us for our next retreat at the Ironwood Christian Springs Ranch just outside of Stewartville, MN. Our next retreat will be Wednesday - Sunday, November 13-17, 2019 . Plan on a great weekend filled with quilting, sewing, friends and fun! The weekend is filled with demos and mini-classes. We will have a "store" available, massages and machine cleaning. We have lots of spacious room to sew in, in a beautiful building with lots of windows set in a lovely wooded area. The retreat is filled on a first-come basis, as we will limit the number of participants. Cost varies from $215-$330, depending upon arrival and how many people are in your room (2-4 people). Choose to come Wednesday, Thursday or Friday. Sewing and sleeping rooms are all in the same building. The time to sign up is now! Download form and mail registration to address shown on the form.